Even though the visual delight 'The Last Supper' couldn't grab the eye balls of the spectators, filmmaker Vinil Vasu is gearing up for his next venture. Titled 'Hello Ajnabee', this multilingual movie will have a huge line of actors from various film industries. Govind Padmasurya, Rahul Ravindran, Reeth Mazumder, Nasser, Mahesh Manjrekar and Anuj Saxena will play prominent characters in the movie. 'Hello Ajnabee' is a tragic love story of a couple who could not meet each other when they needed the most. Set against the backdrops of Mumbai, the story revolves around four men and a woman with each having a story of love to tell. As one man among them is duped and harassed by a female antagonist, the story takes a different turn. Ridhima Pandit has been roped on to play a prominent role. Inspired from a real life story, the movie will be creamed with suspense and thrills. Surat based entertainment group headed by Prakash Dhoryani will cash for the suspense thriller 'Hello Ajnabee'. With Mumbai, Goa, Pondicherry and Kerala as the shooting locations, the movie is being planned to release in April 2015. The producer plans to release the movie first in India and later worldwide. Actor Govind Padasurya is having a great time both getting popularity in small screen and silver screen. Along with anchoring 'D4 Dance', Padmasurya doesn't miss any opportunity to get featured in movies. Meanwhile, Vinil Vasu who was born and brought up in Mumbai has an experience working with Mahesh Bhatt and few other experienced filmmakers. Started his career producing 'Gulumaal' and 'Best of Luck', Vinil directed 'The Last Supper' which revolves around three friends who come across certain unexpected incidents during a journey. Even though, the trailer of the movie was too fascinating, 'The Last Supper' couldn't get back the coins spend on it. 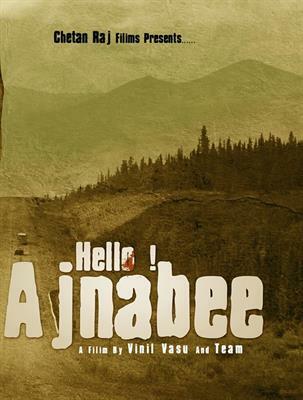 'Hello Ajnabee' seems to be an interesting plot which would bring Vinil back on track.